I’m a huge fan of Lifehacker and having their site in my daily RSS flow I quickly learned of todo.txt that is metioned there from time to time and I of course got hooked. 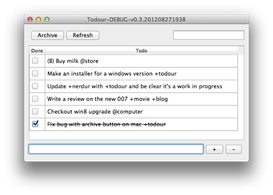 A simple text file with a simple format that can be used for todo-list and then any tool can operate on that file. I started using the android application but I missed desktop applications for handling the list on both Windows and Mac so I wrote one. I wrote it as I simply love the simplicity of todo.txt and the ability to always read and modify my todo-list without any dependency on any software special software or service. It’s been a few months now since I wrote it, and I’ve been using it daily at work (windows) and at home (mac) without any problems so I decided to release it into the wild in case anyone else has any use of it. You can download it from this page. As you may have noted I’ve only put the version number at 0.3. The program is fully functional but lacks features and I will be adding some simple ones when I find the time, but in the meanwhile, please enjoy this 0.3 version. It works well for me so chances are it will for you as well. This entry was posted in Programming on October 30, 2012 by sverrirv. Did a re-install of my daughters Vista machine the other day and got annoyed at all the bloat that came with it that I had to remove, and thought that there must be a better way than to remove all those applications one at a time throught the control panel. 2) If the program is installed with setup.exe use the /qb! command line switches. Anyway, it worked out pretty ok, at least for the programs installed with msiexe and setup.exe. Sadly, most of the bloatware wasn’t.. Anyway. Here is a link to the .cs file. It’s not very well made, just a straight forward hack (and there can be some exceptions cast using it.. nothing serious though). …and don’t think that this is a complete solution. There can be programs in another locations on the computer and some won’t uninstall using this method, but many will, and that was enough for me. This entry was posted in Programming on October 22, 2012 by sverrirv.